If you were to survey a group of movie fans and ask them for their favorite film within a series of sub-genres, you would most likely get a variety of answers. Sure, certain movies would get a high percentage of votes, but probably wouldn't get a unanimous winner in most categories. One of the exceptions would be "shark movie". OK, some wingbats may name things like Deep Blue Sea or The Last Shark, but Jaws would be the clear winner. And for 43 years now, filmmakers have been attempting to make a better movie than Jaws, but no one has succeeded (despite the fact that Syfy has entered about 100,000 movies into the race). This sub-genre has grown so slim that it's rare that we see a big-budget effort, but The Meg has arrived to try and claim the shark movie throne. Deep in the Pacific Ocean, a group of scientists and explorers, lead by Zhang (Winston Chao) and his daughter, Suyin (Bingbing Li), are researching a deep trench. Their submersible, piloted by Lori (Jessica McNamee), breaks through a thermal layer and enters an even deeper trench, when it runs into trouble. Disgraced deep-sea rescue expert, and Lori's ex-husband, Jonas Taylor (Jason Statham), is brought in to help. While diving to rescue the other ship, Jonas and Suyin encounter megalodon, a giant, prehistoric shark. They are able to retrieve the sub, but they soon learn that the megalodon has followed them to the surface. Putting the full array of investor Morris' (Rainn Wilson) wealth into play, the team goes after the shark, but soon learning that catching the largest predator which ever lived is no easy task. Well, in true Hollywood fashion, not only has the title been changed to The Meg, the majority of the book has been thrown out the window as well, where we are basically only left with a big shark and a character named Jonas. Nearly, everything else in The Meg has been created out of whole-cloth, ignoring Alten's characters and, sadly, getting rid of the badass ending. One has to wonder why they even bothered buying Alten's novel to begin with. But, the movie which is left is somewhat interesting. Screenwriters Dean Georgaris and Jon Hoeber & Erich Hoeber, along with Director Jon Turtletaub have wisely steered away from being a Jaws clone for the bulk of the film. Instead, they've made The Meg into more of a monster-movie combined with an old-fashioned adventure movie. The shark here is massive and is treated more like a supernatural predator than a standard animal. Once the megalodon makes its way into the open ocean, the group must attempt to hunt it down, providing a series of scenes in which they learn that they should have brought a bigger boat. It's not until the third act that the shark makes it to the shore and we get the sort of beach attack scenes to which we are accustomed. And while the action scenes are well-done for the most part (the CG gets a little questionable at times) and there's a nice sprinkling of humor, in the end, The Meg is just mediocre. Again, it tries to bring something new to the shark genre, but even those who don't frequent SyFy will feel that they've seen it all before. The cast seems to be up for this odd outing, but Statham was a weird choice for Jonas, as that's certainly not who I envisioned while reading the book. There's no doubt that The Meg is one of the best shark movies to come along in years, and it certainly takes advantage of the unique nature of a truly giant shark, but it's not the "new" Jaws that some hoped it would be. Still, for a dumb high-seas shark-laden adventure, you can do much worse. The Meg perpetuates the stereotype of scary movies starting with the word "the" on 4K UHD courtesy of Warner Bros. Home Entertainment. The film has been letterboxed at 2.35:1 and the Disc contains a 2160p HEVC transfer which runs at an average of 45 Mbps. The image is extremely sharp and clear, showing no overt grain and no defects from the source materials. This is one of those 4K UHDs which make you say, "Oh, this is what it's supposed to look like." The image is razor sharp and shows a clarity that makes you feel as if you could walk into it. The daytime scenes are dazzling bright, and the shots at night show deep, true blacks. The colors look very good, most notably the blues, and the image is never overly dark or bright. The Disc carries a Dolby Atmos audio track which runs at 48 kHz and an average of 3.5 Mbps. The track provides clear dialogue and sound effects. The action sequences deliver very strong subwoofer effects, and we feel it every time the shark hits something. The surround effects are nicely detailed, and we can pick out individual sounds. The stereo effects do a great job of highlighting sounds coming from off-screen. 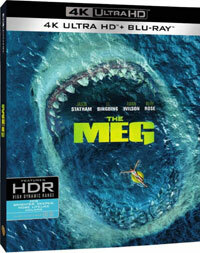 The few extra features for The Meg are found on the accompanying Blu-ray Disc. "Chomp on This: The Making of The Meg" (12 minutes) has Director Jon Turtletaub leading a discussion of the film's production, which touches on the stunts, acting in the water, the visual effects, and the overall feel of the movie. We also hear from some of the cast here. "Creating the Beast" (10 minutes) looks at the design of the megalodon and the specific decisions which were made about size, color, etc. This includes comments from the visual effects team and some test designs. "New Zealand Film Commission" is a 2-minute commercial for New Zealand with comments from the cast.